From its earliest beginnings there had always been one country which could have potentially destroyed the Soviet Union from within. That country was Ukraine. Poised like a blade on the soft underbelly of Russia, Ukraine had the population, the geographic position and the plausibility to strike a mortal wound at the Soviet Union. Stalin, aware of this distinct possibility, ordered grain to be collected in 1932-33 from Ukraine to be sent to the workers in Russia’s industrial population centers. This action culminated with the Holodomor or ‘Death by Forced Hunger’, which killed approximately 5,000,000 Ukrainians outright, and contributed to the disfiguration or incapacitation of another 10,000,000. A half generation later, another 8-10,000,000 or so Ukrainians were killed by World War II, with another 5,000,000 displaced. And yet Moscow still feared Ukraine. Well after the fighting ended in 1945, and unable to pacify western Ukraine until well after 1950, the leaders of the Kremlin ordered hits on Ukrainian nationalists who they saw as troublesome. Most of the exiled Ukrainian nationalist leaders had taken up residence in Munich, for myriad reasons, and were leading the continued struggle against the Soviet yoke. Many Ukrainian nationalist newspapers were being printed in Munich, smuggled into western Ukraine in order to fan the flames of the still smoldering desire for a free and independent Ukraine. Lev Rebet, the publisher of many of those publications and a three year survivor of Auschwitz, was assassinated by Bohdan Stashynsky in a somewhat rundown building at Karlsplatz on 12 October 1957. The building housed the offices of Rebet. He was killed by a special gun which sprayed cyanide gas. At the time the death appeared to be of natural causes. There was still work to be done for Stashynsky, and a little more than two years later he accomplished his goal. Stepan Bandera, the most popular and controversial Ukrainian nationalist leader, was killed by a modified version of the gun on 15 October 1959. He died at Kreittmayrstrasse 7, a hundred meters or so northwest of the Löwenbräukeller. 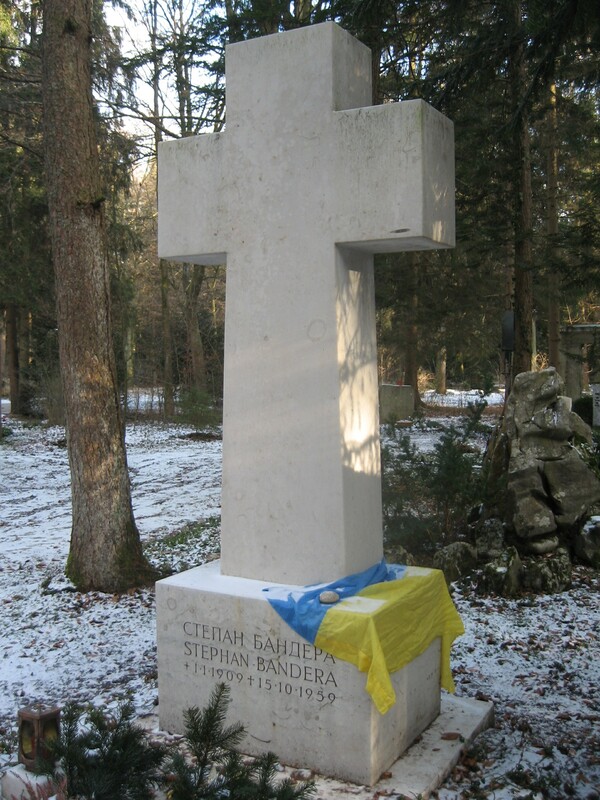 He was interred at Munich’s Waldfriedhof, and his grave has become a sort of minor pilgrimage site for western Ukrainians. Stashynsky was ordered by the Kremlin to kill Yaroslav Stetsko, but didn’t carry out the mission. 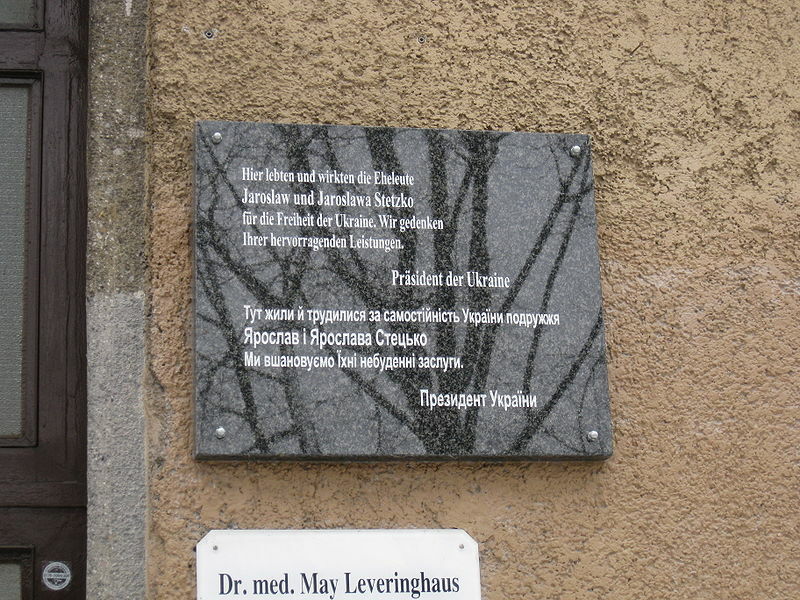 Stetsko was yet another Ukrainian nationalist leader who had made Munich his home. Stetsko died of natural causes in 1986, in Munich five years before the creation of an independent Ukraine. A plaque commemorating Stetsko can be found on Zepplinstrasse in Munich. Stashynsky later defected to the West and admitted to killing both Rebet and Bandera. When Stashynsky was tried for his offences he was found guilty of much lesser charges than both Alexander Shelepin (Head of State Security) and Nikita Khrushchev. Stashynsky had become a KGB hit man after much pressure from the Soviet government on him and his family. The court ruled that the majority of responsibility lay at the feet of Khrushchev and Shelepin more so than the trigger man. Stashynsky’s last known residence was in South Africa with an assumed name and his German-born wife Inge.